Summertime food in my opinion should be quick and easy to prepare. After all who wants to slave in the kitchen, even with the a/c on or for any length of time, or at the grill in 90+ degree weather? 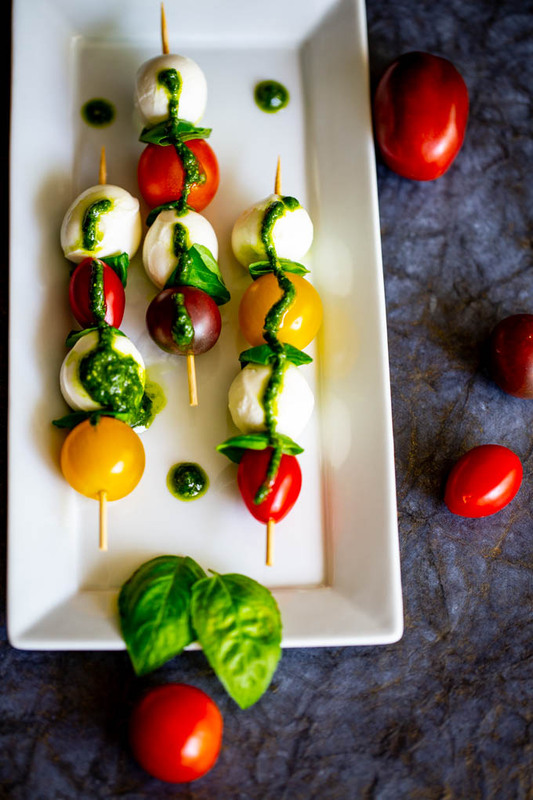 That’s one of the reasons I love these Caprese Kebobs with Basil Pesto. They’re quick and easy, packed with flavor, and refreshing! Ca·pre·se (kəˈprāzē) – is Italian, which means literally ‘of Capri.’ A beautiful island my daughter and I visited many years ago in Italy – Isle of Capri. 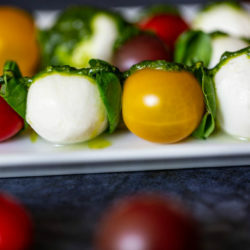 Caprese denotes a salad of fresh mozzarella, tomatoes, and basil. 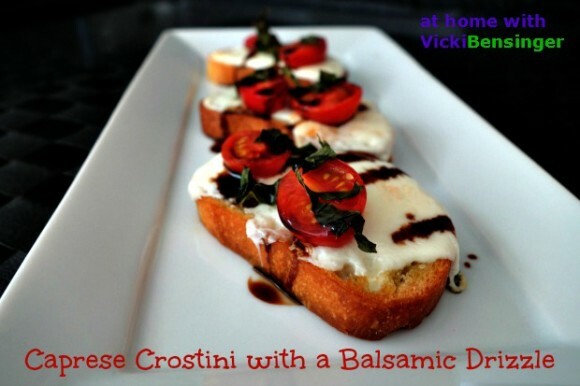 Many will drizzle their Caprese salad with balsamic vinegar, balsamic reduction, or basil pesto. I enjoy both, but with this kebob I chose a basil pesto. Caprese Salads can come in so many different forms. Since kebobs are so easy to put together, even the kids can help. 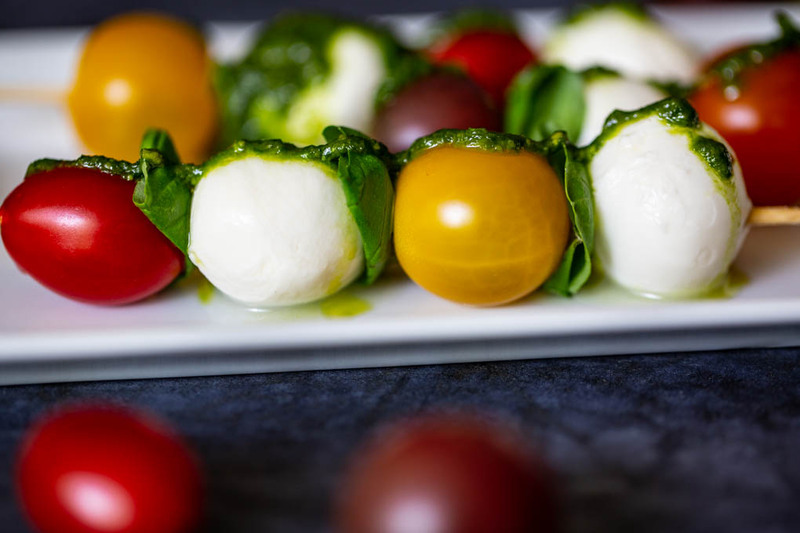 You may have had your Caprese salad with large slices of heirloom tomatoes, buffalo mozzarella, and fresh basil leaves drizzled with balsamic or pesto. It’s often served that way at restaurants. 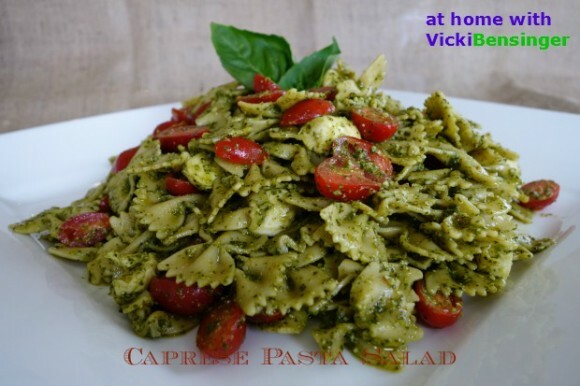 My family loves it when I make my Caprese pasta salad. I haven’t made it in years, but will be sure to link to that blog post below. 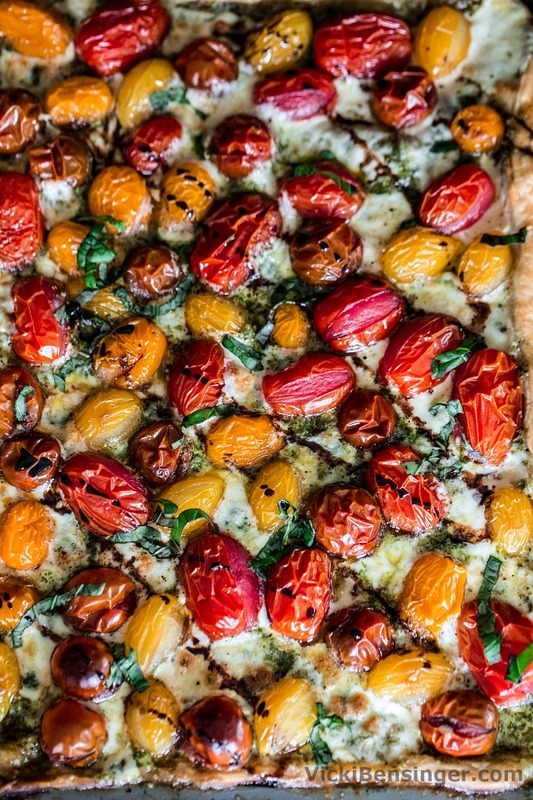 What’s not to love about fresh tomatoes, fresh mozzarella and fresh basil. It’s literally summer on a plate. So refreshing, light, and satisfying. Honestly it doesn’t get much better than that, unless you can have it in Italy. Why? Because in Italy the tomatoes, in my opinion are the BEST I’ve ever had. There’s just no comparison. 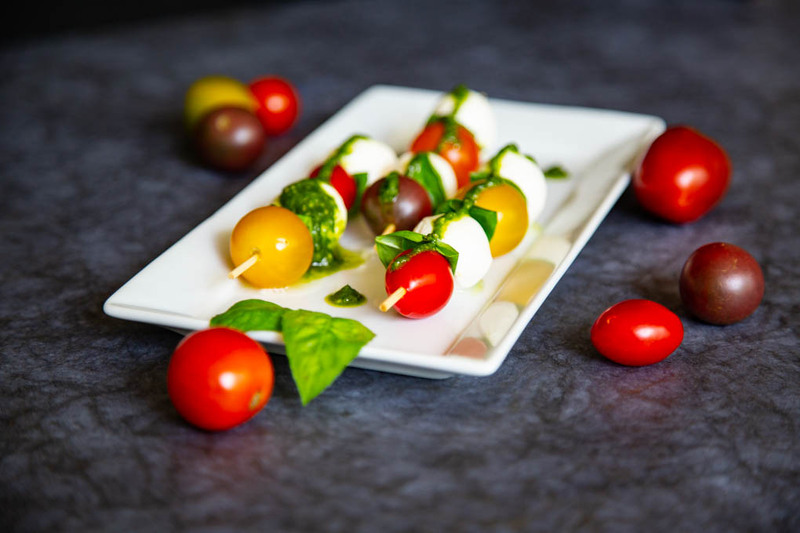 If you can’t make it to Italy I hope you’ll at least try my fun summer Caprese Kebobs. They’re ideal for outdoor picnics, large parties, dinner at home, or for a light snack. I’m quite sure you’ll like them. 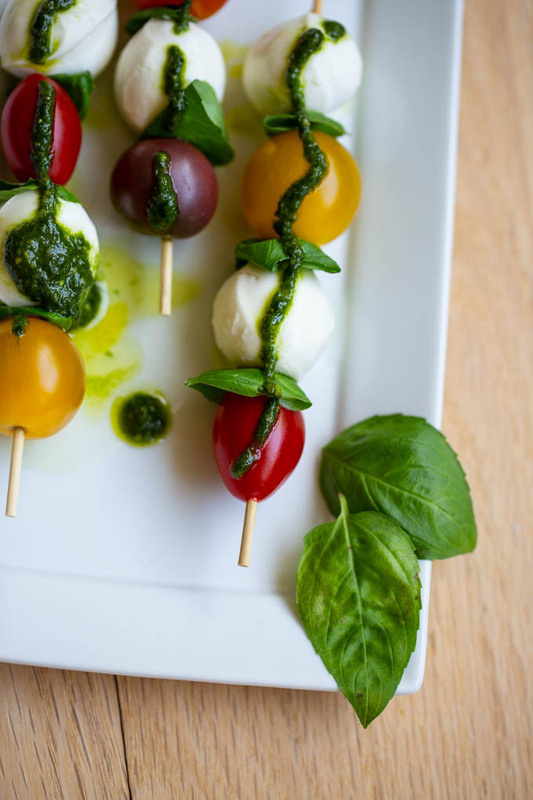 These Caprese Kebobs will have you feeling like you're sitting on a veranda looking over the Mediterranean in Italy. Well maybe not quite like that but we can dream! With a kebob skewer in hand start by placing a baby tomato on the stick. Fold one basil leaf in half, shiny side out, and place on the stick above the tomato. Add a fresh mozzarella ball, then add a fresh basil leaf on top of the cheese. Repeat until you reach the tip of the kebob stick. Continue for each skewer until you've reached the number you'd like to have. You can also use larger skewers if desired. 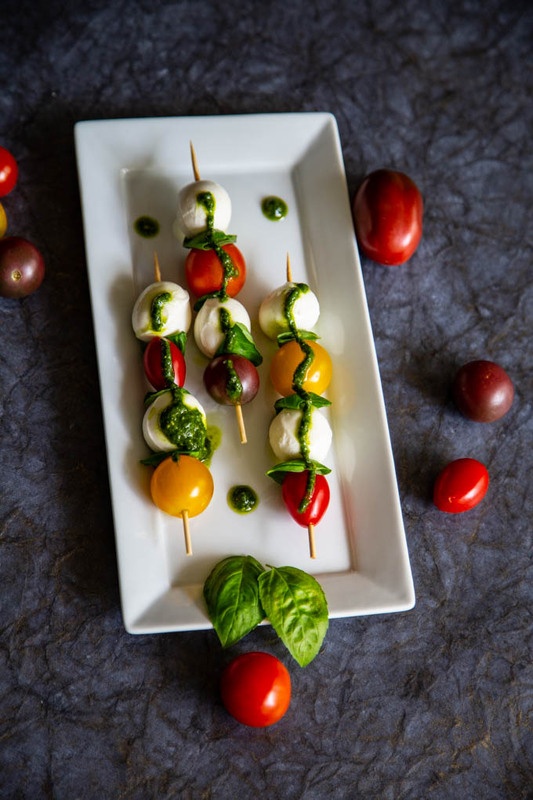 Plate: lay skewers on a plate and drizzle with pesto. This is one of my favorite summer combinations! The skewers make it perfect party food! One of the best summer salads! Love your beautiful presentation, Vicki. 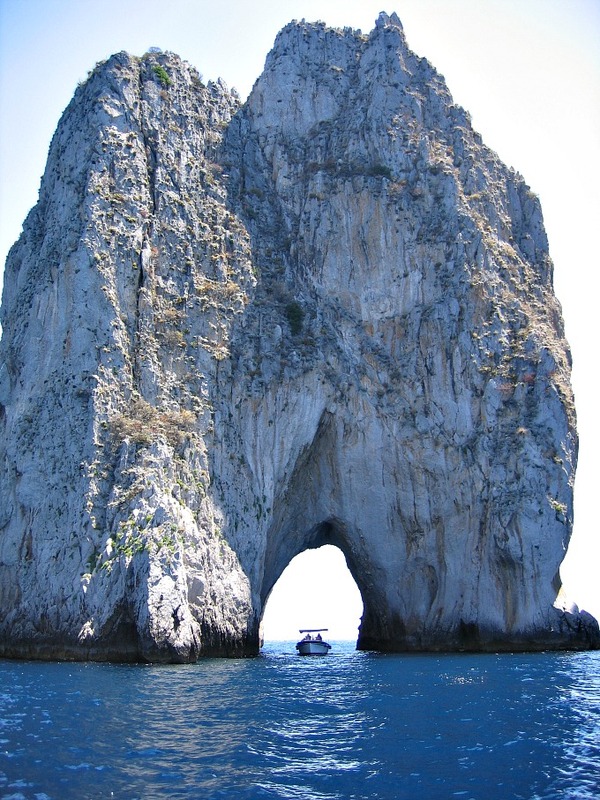 I have yet to visit Capri — would love to go. In the meantime, I’ll just have to satisfy myself with this wonderful looking dish. Thanks!